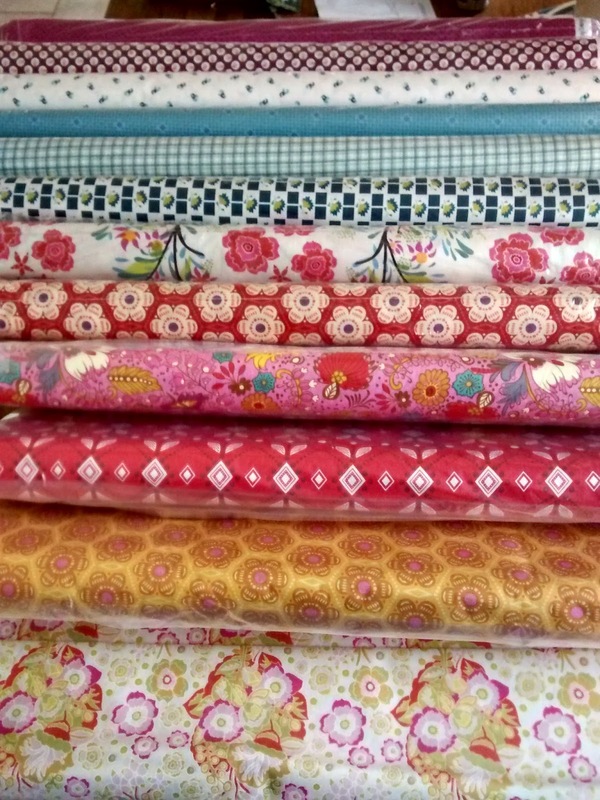 AMH, Denyse and Skinny La Minx....so much new fabric! We think we've got the best jobs in the world, but some weeks are just super exciting! 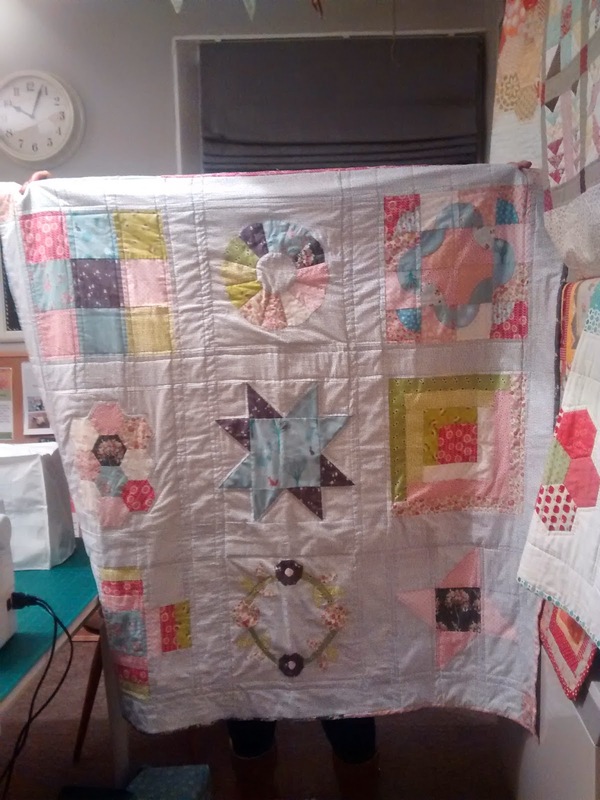 We have been Lori Holt fans for ages now, our Bee in Your Bonnet Class from Lori Holt's book of the same name is a real PlainStitch favourite and this years class are turning out some of the most jaw droppingly wonderful quilts! 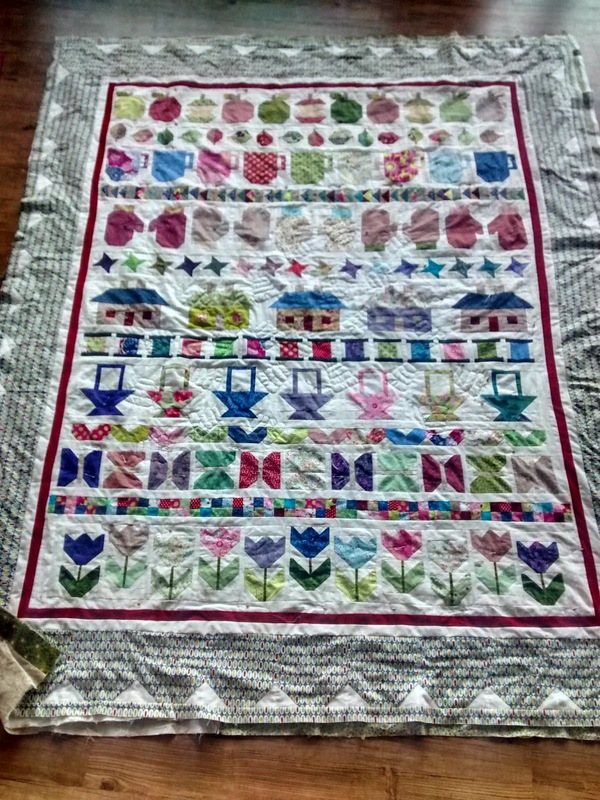 Look at this one from Sue, so close to finish - gorgeous! We're delighted to announce that we will be stocking Lori Holt's new book Farm Girl Vintage when it is released next month. Usually to get her books in the UK you need to expect an expensive shipping fee and usually a customs fee too so it can be a 'hard to justify' buy from the USA. We will be stocking the book from when it is launched - at the moment eagerly awaited in April...we'll let you know! 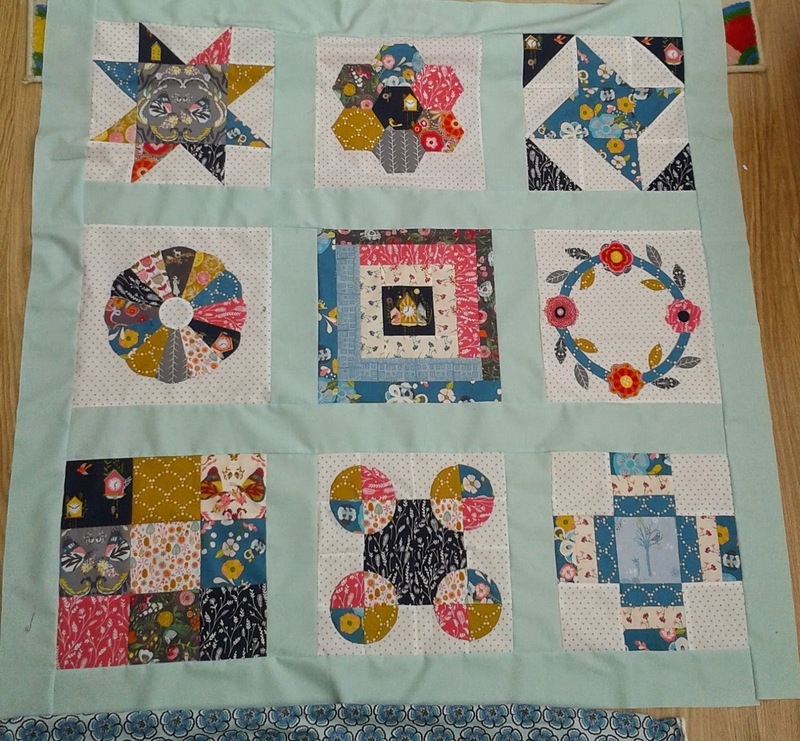 Today we ran our first Make A Baby Quilt In a Day class for Absolute Beginners. It was such a fab class, run very calmly by Claire despite a busy stream of shoppers 'popping through' the classroom to shop our Half Metre Spring Madness Sale! 4 complete machine patchwork beginners turned out the most wonderful and colourful baby quilts in a day - they did work really hard and their quilts were fantastic! Lucky babies and kiddies that are the special recipients! The Workroom is awash with springy colour at the moment.. .so much lovely and innovative new pattern. This is Anna Maria Horner at the bottom of this pic - a long time favourite fabric designer with her re issued Folk Song fabric line which is one of my old favs. 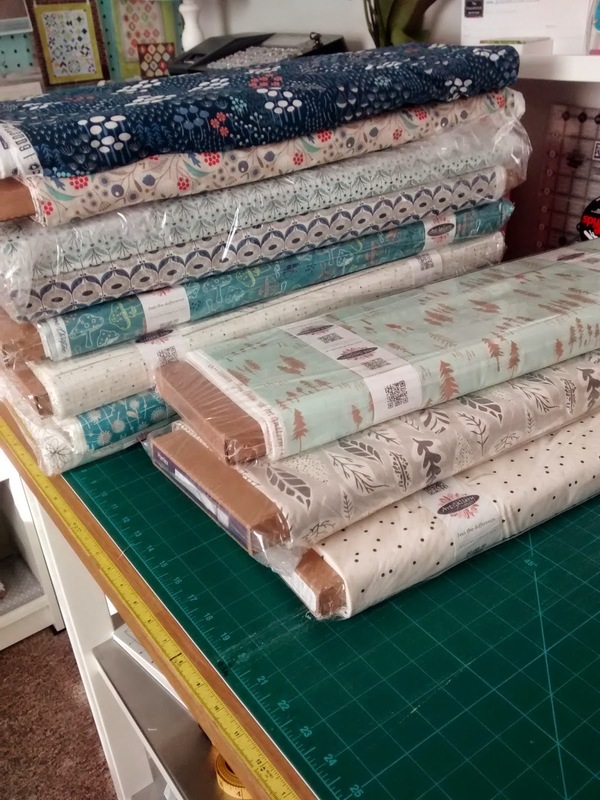 Also the fabric at the top of the pile is Denyse Schmidt Franklin - such great vintage-patterns-in-a-modern-colourway fabrics, also a personal fav. Also new is this lovely I'm a Maker fabric in scissors and sewing text fabric - def one to stash for sewing related future projects - I really fancy the scissors print as the inside cover of my embroidered needlebook at Victoria's class next week! 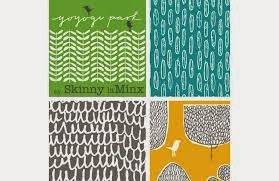 The glorious prints on this pic are by Skinny La Minx, as South African designer and another long time favourite. Previously her printed fabrics have been produced on a linen blend fabric which is great for some projects, but not so great for patchwork so I'm so pleased to see these lovely Art Gallery fabric prints in their famous silky soft cotton. We'll be closed after Friday 27th March for some building work to extend our main classroom and set up a second classroom so until next Fri we are reducing all 1/2m pre-cuts to £5. This pic was taken on Fri morning and the boxes are 'well shopped' (!) 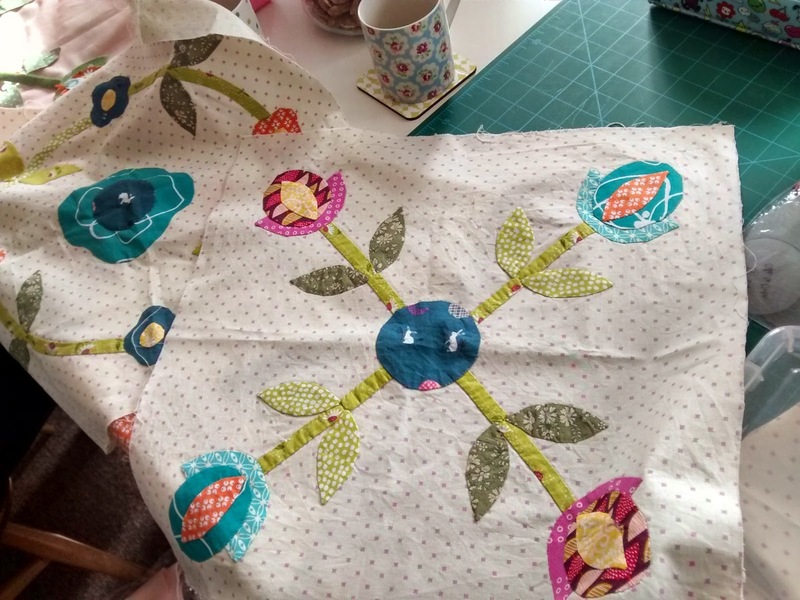 as of Saturday eve - but there are some fab prints still there - I love 1/2m cuts - they are the most versatile - just the right size for so many projects from quilt binding to bags and baskets and scarves and so much more... def worth a stock up! 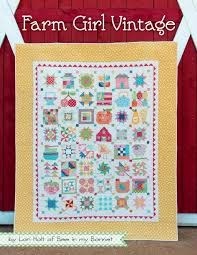 I LOVE this spray it really makes a difference and if you are a quilter I think you'll love it too. Just shake the bottle, spray onto your fabric and press. It makes the fabric crisp, so it's much easier to rotary cut. It's great for fabric cut on the bias, stops it from stretching out of shape when sewing. It's great if you want to get your seams crisp but not stiff. The sun is trying to shine, daffodils are blooming along the sides of the roads and birds are singing - yay spring! We're full of the joys of spring, with lots of exciting plans for The Workroom over Easter and the launch of our autumn class schedule just a few weeks away! To clear some space ahead of our building work at Easter we're offering all of our pre-cut 1/2m pieces for £5 each. 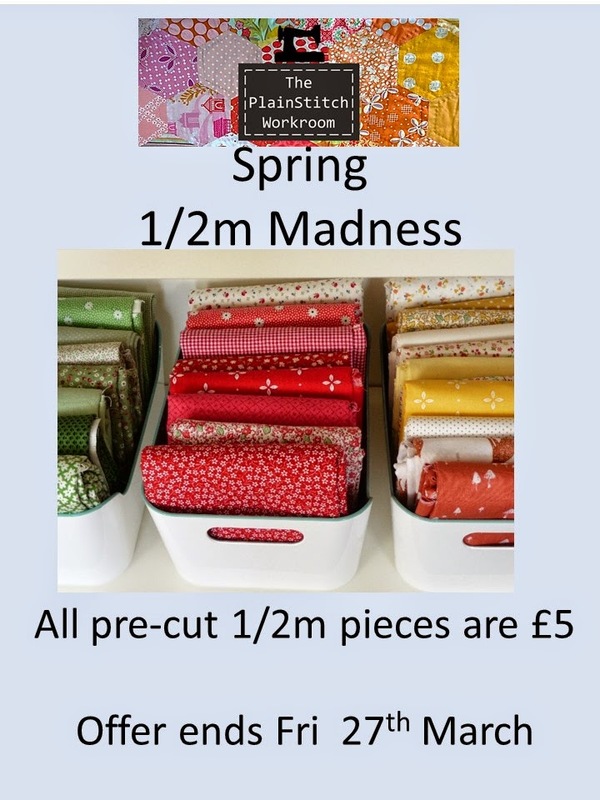 I love 1/2m pieces, they are my favourite precut - just enough for a project, you won't frun short like with a FQ and they are the prefect size for so many projects from Fabric Baskets to Scarves and Granny Bags. Stock up! We've had such a packed schedule the last couple of weeks that I almost can't remember every class we've taught! Our Comic Relief Crafternoon on Friday was so much fun and many felty chicks were made and we raised just over £100 for Comic Relief. Remember that you still have until Friday to bid on one of our class sample items, all proceeds to Comic Relief. We have Simple Samplers coming to completion, Log Cabins and Farmers Wife quilts getting nearer, Bee in My Bonnet loveliness, so much Free Motion Embroidery inspiration bursting out of our pages on Facebook at the moment - and such exuberance! We have had gorgeous lampshades, lovely fabric baskets, so many little people making their Easter Egg Bags in anticipation! 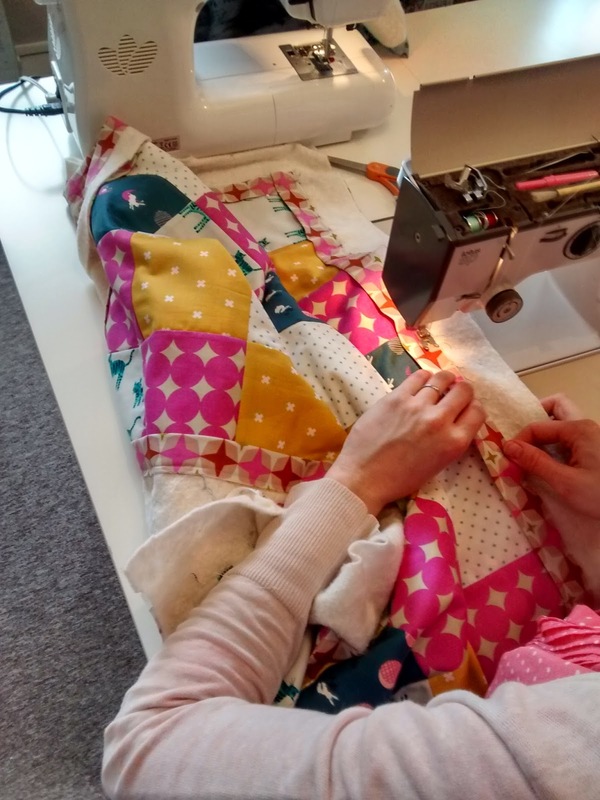 We have dressmakers learning how to amend patterns for their measurements, Little Girls Dresses nearing completion, lot's of Getting To Know Your Sewing Machine and much much more! 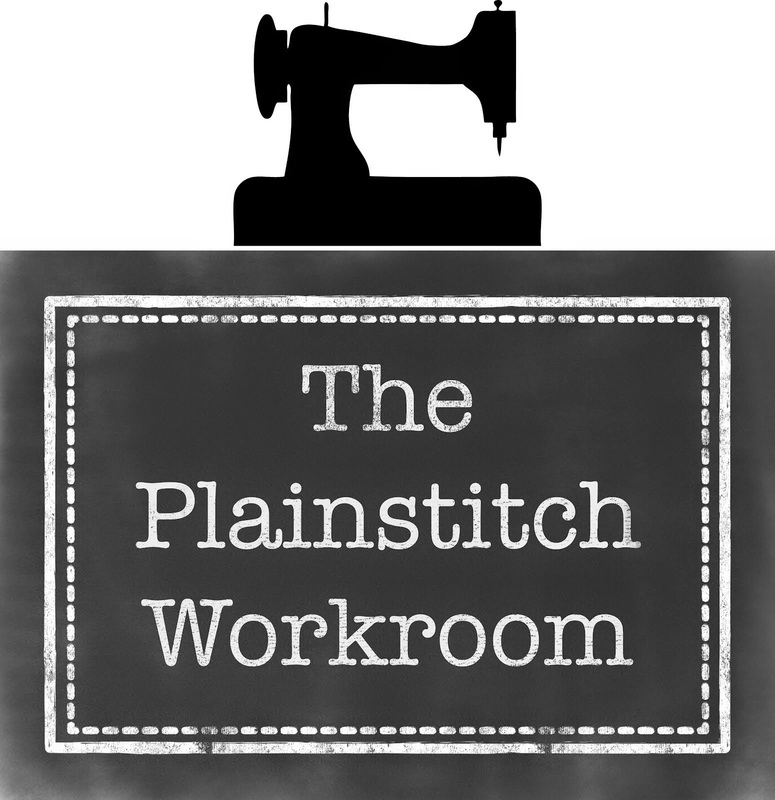 This Easter we have exciting plans for expansion at The Workroom so we will be closing on Fri 27th March for an extended break to allow us to clear everything out, knock down walls and then fit it all out again in glorious PlainStitch style! 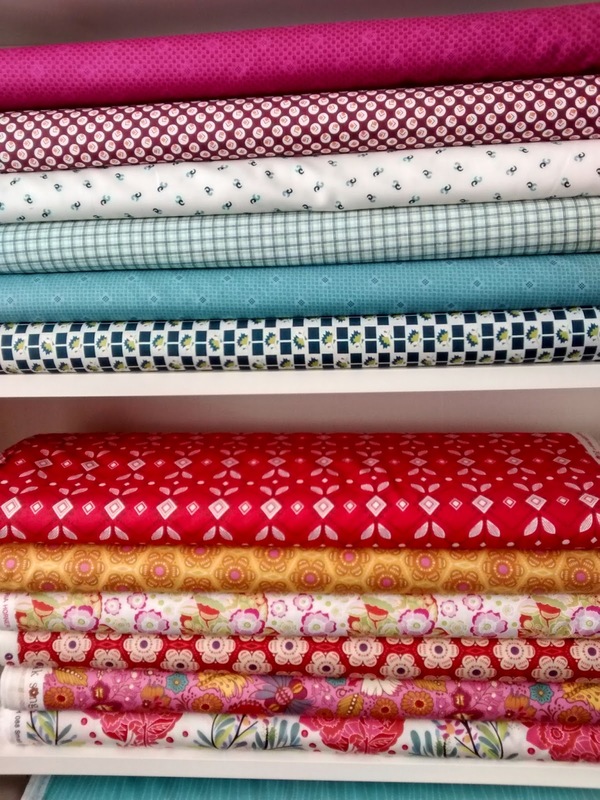 If you think you'll need a fabric fix in the next few weeks come and shop our £5 Half Metre Madness in the next week to make sure you won't run short! When that spring sun starts to shine you want to be ready for inspiration to strike! We are open Thurs and Fri 9.30am - 1pm and Sat 10am til 3pm this week, then Wed - Fri next week 9.30am - 1pm then we close for Easter. 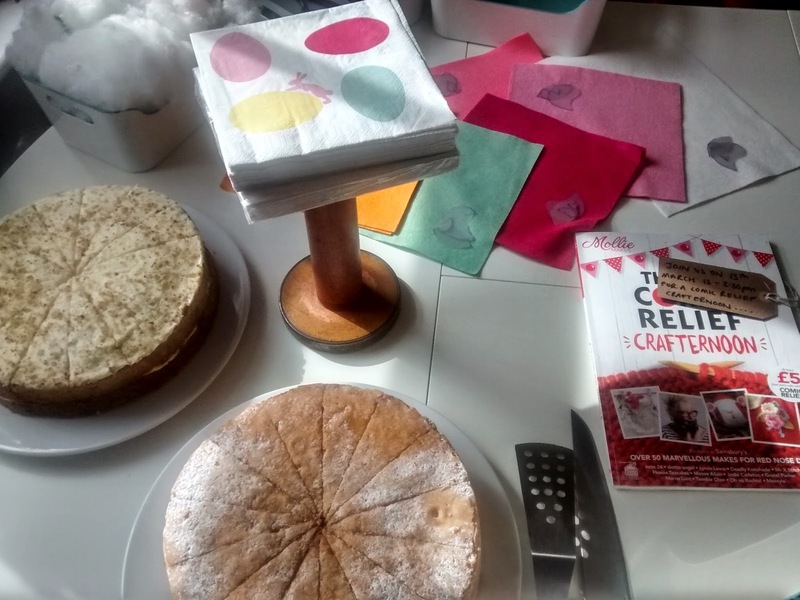 Stuffed Full to Bursting - Comic Relief Crafternoon. This deliciously ample pin cushion seen today at The Workroom pretty much sums up this week in The Workroom! This week we have been over flowing with new fabric. Fruity prints so zingy and springy with classic ginghams. I've been on a bit of a knitting run since the Retreat Day, knitting a little overdress for my daughters felt Bunny. Claire has taught two completely jam packed Free Motion Embroidery classes this week. Its been brimming with fun, friendship and free motion freedom! 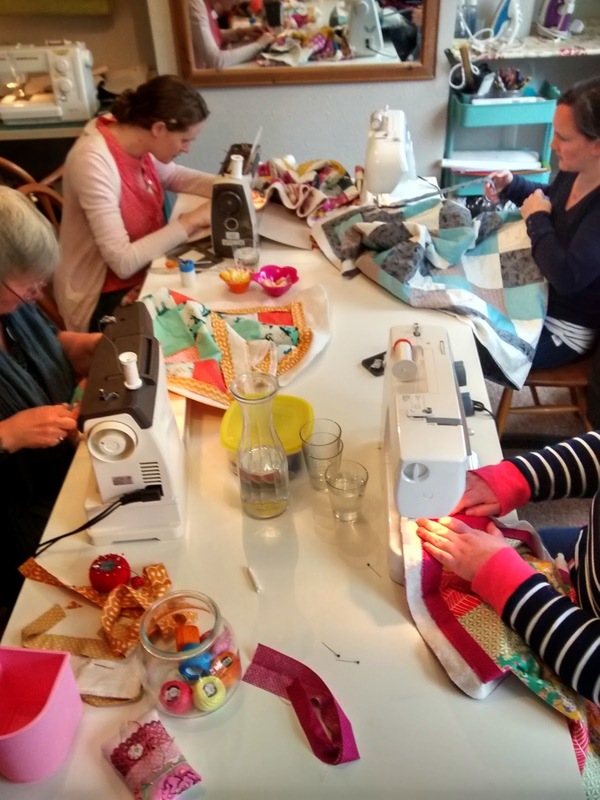 The Workroom has been standing room only as these ladies took to free motion sewing like ducks to water under Claire's gentle encouragement and surrounded by fabulous inspirational examples of Claire's individual work. What I love about this class is that it sets the participants free to create completely individual sewing art. There are no clichéd cupcakes here, just 100% personal pieces of sewing. I love it! We're running a silent auction at the Crafternoon for some class samples. All proceeds to Comic Relief. Jeanne has kindly donated this couture Geranium Dress made by Jeanne, age 4-5 years from last years Little Girls Dresses Class is up for grabs. Just enter your best bid in the jar. We will announce the winner of the highest bid next Friday. You can bid on e mail- deb@plainstitch.co.uk if you can't make it to the shop tomorrow, and you have until next Fri 20th March. We've a whole host of goodies! By Debs @PlainStitch. Simple theme. Powered by Blogger.